Keeping up with the developments in any field can be a challenge, especially with so much information spread across so many sources. Frequently this information is accessible online, but it’s tedious to regularly visit each of these sites for new content. I’ve found this to be especially true with academic journals, where there are a whole series of publications relevant to me, each with their own website and own release schedule. Adding sites to your reader is easy, with most services allowing you to just type or paste the URL to start following the site. There are many choices for readers these days, including both standalone applications and online services, with both free and paid options. The two best options in my opinion are Feedly, which is free, and Feedbin, which is my personal choice and costs $3/month. Both of these services can be used from your computer, but are also compatible with a variety of mobile applications. My personal favorite is Reeder. 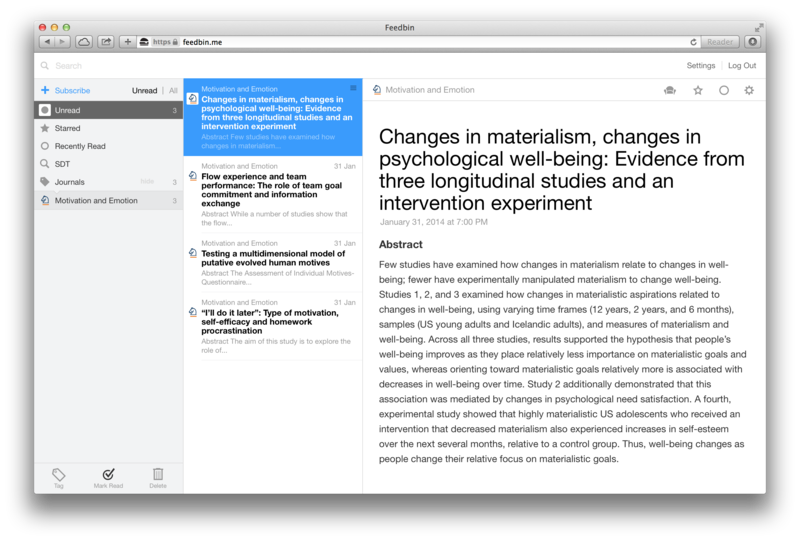 One of the unexpected benefits to using a feed reader for academic journals is that it actually makes reading journal abstracts enjoyable. At least for me, that’s something I didn’t often experience before.